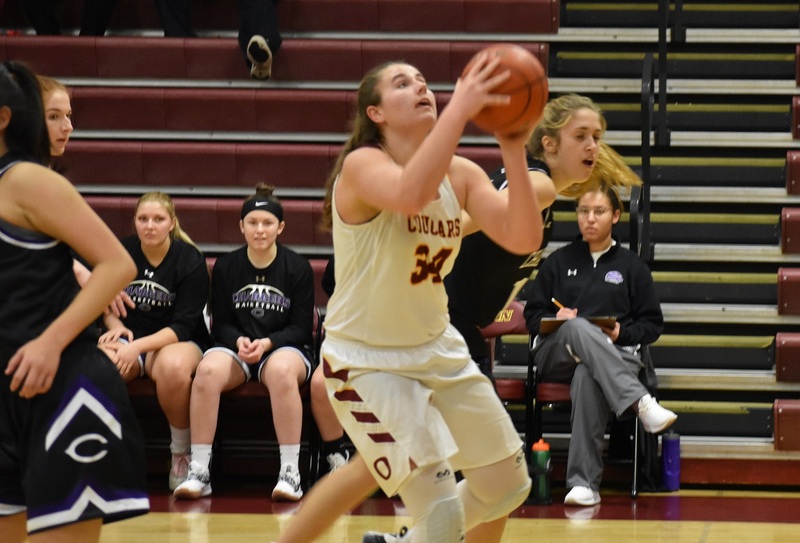 Oakton's Grace Meshanko ran the point and still found time to do damage inside (10 points, eight rebounds). Conventional basketball wisdom sometimes goes out the window for playoff games, but as a general rule of thumb if you can hold your opponent to six points for half the game, you win. That’s exactly what the host Oakton girls did to Chantilly Tuesday night in a Concorde District Tournament semi-final. The Cougars limited Chantilly to two points in the second quarter and four points in the fourth. They won, 38-29. 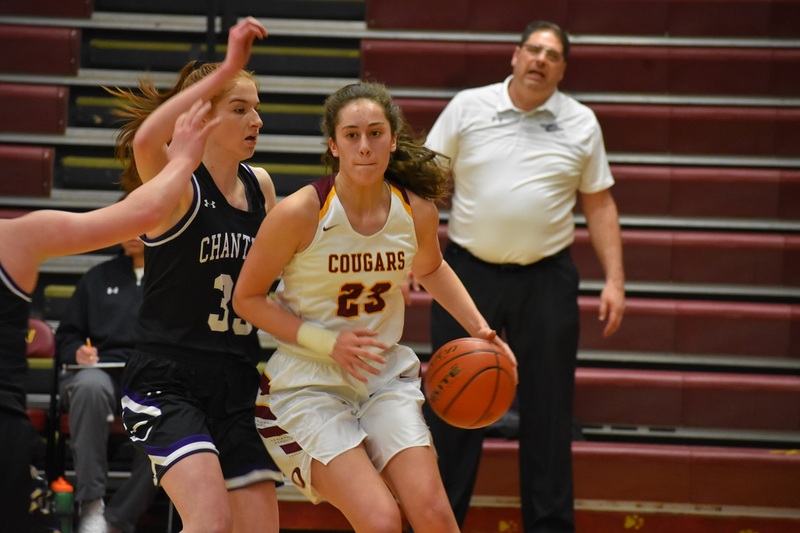 Oakton is always a postseason threat and the Cougars demonstrated Tuesday some tools of their game that make them so yet again. The defense was superb and nearly impenetrable down the stretch. Oakton also has good size and demonstarted what that can mean against a Chantilly team that is by no means small. The Cougars out-rebounded Chantilly 29-15 and got to the line 17 times to the Chargers’ four. Oakton sophomore Hannah Kaloi drives the baseline, to the chagrin of Chantilly coach Kurt Sporkmann. The Chargers, who had defeated Oakton in their most recent meeting, led 9-6 after a quarter. Then, the Chargers simply couldn’t score. Star sophomore forward Meghan O’Brien got a bucket with just under two minutes left in the half–her first points of the game–but that was all the offense Chantilly could muster in the second quarter. Oakton led 20-11 at half. Chantilly made some adjustments and came out fired up after halftime. Senior guard Jiyun Chae stole the ball and went for a lay-up to begin the scoring. O’Brien and fellow sophomore Megan Baxter started to get untracked, and Chantilly cut the lead to 26-25 late in the third. Then the Chargers (9-11) could only score four more points as they missed shot after shot down the stretch. Oakton was by no means highly efficient on offense, but the Cougars kept pushing the ball down low and got to the line. That was enough. 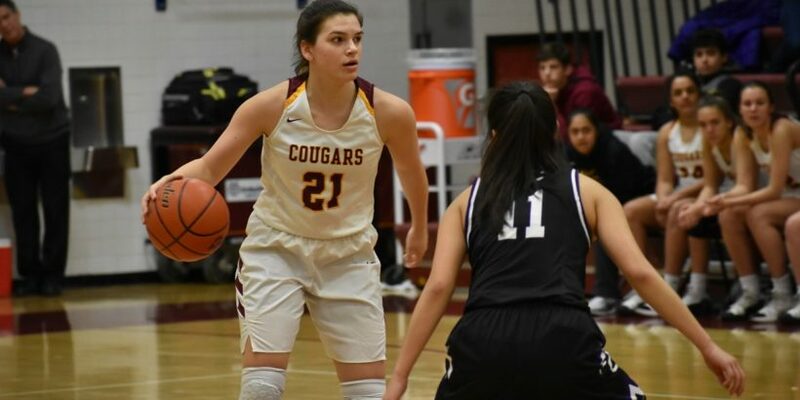 Kate Vietmeyer was a force inside for the Cougars. Three players carried the Cougars on offense. Senior center Kate Vietmeyer had 12 points. Versatile sophomore wing Hannah Kaloi had a double-double, with 10 points and 11 boards. Point guard Grace Meshanko added 10 points and eight boards. For Chantilly O’Brien led the way with nine points. Oakton (18-5) advances to face rival Madison for the Concorde District Championship later this week. Both teams will be in action again next week, in the regional tournament.